Staff is very kind and trustworthy. The hotel fresh juices are delicious, especially the watermelon one. 20 minutes by car gets you to a fun touristy beach. Hotel is close to Tanah Lot. The villa design from the inside is beautiful. The staff keeps the villas very clean. This Villa is beautiful. We booked for a family for a 4 night stay after already staying in busy parts of Bali for 9 nights so we were looking for a Retreat. The pool, outdoor bath and the overall feel of the villa is great. The staff made the villa even better, we would stay there again just to see them. This villa is in the middle of nowhere but that’s the appeal of it also. The shuttle to canggu and Seminyak helped so much and made this place worth booking. We did order room service and it was great also. Also a must is Echo Beach Cafe in Canggu, splash in Canggu for families and the Tanah Lot Temple. We could enjoy having breakfast with nice rice paddy view. All staffs were nice and friendly, and response was very quick. Especially Budi was very attentive. I recommend you to have a driver or rental a car since the villa is located in the middle of nowhere. The ambience was excellent, staff extremely thoughtful and attentive- they went out of their way to please! Overall, an excellent place to stay. Hope to come back again! Very quite and private place. Good swimming pool. Helpful and welcoming staff. The reception lady named Dewi is very attentive. Clean and big rooms. i have never been to a villa with this kinda view! literally surrounded by green paddy fields, the villa has all the need we want to have a quiet and tranquil vacation. The staff is very welcoming and all we asked is done with fast response. We borrowed bike to go to Nyanyi beach that took about 10 min. In the night, theres only frog and cricket orchestra with no loud noises. such a good experience! Bed was very comfortable, spectacular views upstairs. Friendly staff and the car service was very convenient. Privacy for us as we are on family holiday. The villa is surrounded by padi fields and it’s a peaceful scenery. Love them. The swimming pool is clean and the staffs are very helpful and polite. Getting around is no problem because the staff will help us to get transport to around Tanah Lot. We really enjoy our stay! Thanks to all the Villas staffs. Lock in a great price for The Kryamaha Villas – rated 8.7 by recent guests! The Kryamaha Villas This rating is a reflection of how the property compares to the industry standard when it comes to price, facilities and services available. It's based on a self-evaluation by the property. Use this rating to help choose your stay! One of our top picks in Tanah Lot.Nestled within green stretches of rice fields, Kriyamaha Nyanyi Villas is a 10-minute drive from Nyanyi Beach. Barbecue gatherings and pampering in-villa massages can be arranged upon request. The property also offers free WiFi access, free bicycle use, and free scheduled shuttle service to Nyanyi Beach and Tanah Lot Temple. 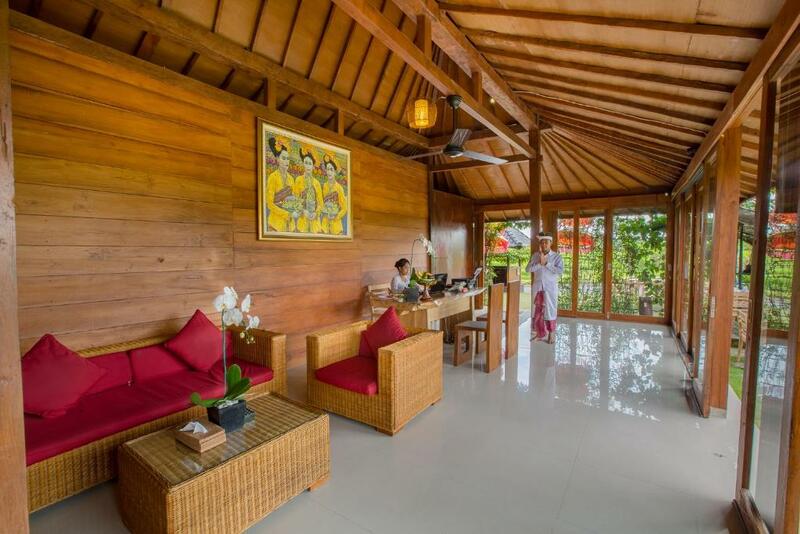 Kriyamaha Nyanyi Villas is a 30-minute drive from Tanah Lot Temple and a 45-minute drive from Seminyak area. An hour’s drive from the property leads to Kuta area and Ngurah Rai International Airport. The stylish villas are all fitted with a well equipped kitchen, dining area and ample living space with a flat-screen cable TV. A safe and a private bathroom are available in all bedrooms. A jogging track is available on site. Staff can arrange airport transfers, vehicle rental and laundry service at extra charges, while Wi-Fi access is available for free in all areas. Free trekking trip to Beraban Village located next to the property is offered. A private chef is available to prepare meals upon request. When would you like to stay at The Kryamaha Villas? Suitable for up to 4 guests, this 2-bedroom villa features a fully equipped kitchen, dining area and a living room with sofas. Each bedroom has a flat-screen cable TV, personal safe and a private bathroom with bath or shower facilities. This villa can accommodate up to 2 extra beds for 2 extra guests. - Free scheduled shuttle service to Nyanyi Beach and Tanah Lot Temple. Suitable for up to 6 guests, this 3-bedroom villa features a fully equipped kitchen, dining area and a living room with sofas. Each bedroom has a flat-screen cable TV, personal safe and a private bathroom with bath or shower facilities. This villa can accommodate up to 3 extra beds for 3 extra guests. This villa features a iPod dock, air conditioning and toaster. The Kriyamaha Villas was built on contemporary architecture and admirable designs, this modern style villa stands tall with grace and majesty in the middle of rice paddy field and is specifically designed to be an exclusive sanctuary for holiday getaway. Perfect for honeymooners, group of friends and family, this jewel is designed to harmonize your true self with nature and to spend your precious time with the loved ones. This fantastic, well-sized modern accommodation uses its excellent location offering wonderful opinions, a large quantity of sunlight and various levels. All one-, two- and three-bedroom villas are developed keeping in view the modern culture and requirements for luxurious lifestyle. Plenty of facilities provide you with the taste of life. Private swimming pool and sun terrace are just a glimpse of the fun offered. The overall view from outside looks just an amazing structure that you can ever dream about. Indeed this is a fresh new endeavour in an excellent location. House Rules The Kryamaha Villas takes special requests – add in the next step! One child under 6 years is charged IDR 500000 per night when using existing beds. The Kryamaha Villas accepts these cards and reserves the right to temporarily hold an amount prior to arrival. Please inform The Kryamaha Villas of your expected arrival time in advance. You can use the Special Requests box when booking, or contact the property directly using the contact details in your confirmation. The hotel is a little bit far from tourist spots. Food is OK. Air conditioning could be better. Pool is very beautiful but kind of small. Just bring snacks and plan meals as you can’t just walk up the road to a restaurant or circle k. Negatives minor and not worth noting. It was distant from many things you have the tannah temple around but not much to see its distant from the road where you will find mini markets about 1km away. Booked 2 villas. Bugs everywhere,6 lizards on day1 but after complaining about it,staff tried to shoo them away,finally i was left with 2.Big butterfly was in my bedroom. As per the staff since the property is near a rice feild these bugs were normal.but not normal for me as i planned to stay in a villa and not a forest or a rice feild. There was a bat hovering over the pool on day 1 Day 3 pool changed colour to green and staff didnt know what to do.Manager was absent so my issues were addressed to Budi who couldn't do much and was apologetic. First floor room airconditioner flap was broken,was taped to keep it open and cooling was horrible. Finally pool was cleaned on last day of my stay and I was able to talk to the manager who said pool changed colour due to rains but staff gave me a different excuse that villa pool was extensively used by guest before me and they didn't have time to clean. offered us free dinner on last day and ofcourse I declined since my stay had been ruined though had a coffee complimentary. I was not offered any alternative villa. Staff only had one excuse-"i don't know what to do ".Juices offered with breakfast are similar to Tang..not fresh. Villas are 8 years old..need major dose of pest control and touch up. Good for low/ no frills travellers hipsters types. Breakfast was good and on time. Staff is good and I find them innocent. If you want to really enjoy the peace and solitude, merge with nature and at the same time live in comfort, this is definitely what you are looking for. The villas overlook the Rice terraces, leaving an unforgettable effect. Perfect location. The Breakfast was just great, everything was delicious and enough. Also worth noting the staff which was at the highest level under the leadership of Mr. Budi Ana. Probably, it was his kind attitude to people, responsiveness that made our stay unforgettable. Definitely advise this place to all, and I hope this summer will come again with my parents. Remember the name Budi Ana in any situation just ask him and he will do his best to solve everything from renting a motorcycle to travel around the Islands. Thank you Mr. Budi Ana and staff for your professionality. The location wasn't that strategic, need some time to find it. The aircond on upper level of my villa wasn't working really well, so does the heater. The water is not hot at all, have to shower using the bathroom downstairs. Staffs are very friendly and will try their best to attend to you. The villa is spacious with a nice paddy field view behind. Because of its location, it was quite secluded so not much noise. Only nature white noise. Very good privacy. bugs, caterpiiars, and since the bath tub is placed semi outdoor... so we always have to clean it before use because it was almost always dirty. A bit of variety in the food! The villas are quite far away from restaurants so you have to walk a lot (which is not easy on the streets in Bali) or you have to go by car As we had no own car on Bali this was sometimes difficult. You can get nice meals in the villa but they are priced rather high (for Bali that is). The rooms are big and nice, we used the private swimming pool often. We loved the breakfast, especially the banana pancakes. The staff was very friendly and helpful.